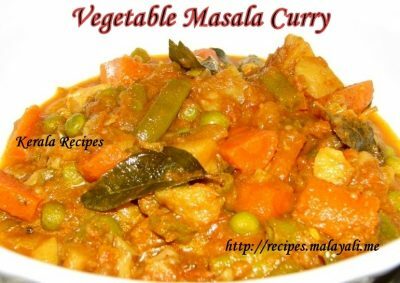 Here is a one pot Vegetable Masala Curry which goes well with Roti, Appam, Puttu and even Rice. If you want to finish the vegetables lying around in your fridge, then think no more. Try out this simple and tasty mixed vegetable curry. You can use vegetables like Potatoes, Carrots, Beans, Green Peas, Cauliflower, Capsicum and so on for this curry. This curry is healthy as you are not using any cream or coconut milk for the gravy. Heat 2 tbsp oil in a pressure cooker and saute onions and green chillies until the onions become translucent. Throw in the curry leaves and continue sauteing for a few minutes. Reduce heat and add ginger garlic paste, turmeric, chilly, coriander and garam masala powders. Saute for two minutes. Add the chopped tomatoes and all the vegetables along with 1 cup of water and salt to taste. Add more water if you want more gravy. Close the pressure cooker and cook for 2 whistles on medium flame. Remove from heat and allow the pressure to subside. Serve this yummy vegetable curry with Rotis, Appam or Rice. Super Curry… I made it today..